Trim the ends of the grapefruit so they sit flat. Place on a baking sheet cut side up. Run a knife around the edges and between the segments of the grapefruit. Brush 1 Tablespoon of the rum over each half grapefruit. Combine the Butter Olive Oil with the light brown sugar to make a paste and spread the paste over each of the grapefruit halves. Dust with cinnamon and cayenne. 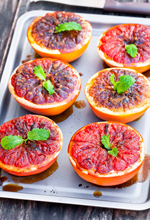 Place a cherry in the center of each grapefruit and broil the grapefruit until bubbly and slightly caramelized (about 5-6 minutes). Rotate pan if necessary.